The Royal Ontario Museum (known as the ROM by natives) is Toronto’s archaeological and historical museum that has a fantastic collection of Chinese art and dinosaur fossils. In the midst of the University of Toronto campus, the ROM was a favorite place of mine to wander and spend time. Now the new $270 million addition by Daniel Libeskind has made the museum an international sensation–Liebeskind you’ll remember was the architect that was originally chosen for the WTC site, which as become a fiasco. The Toronto Star‘s Chirstopher Hume, who I read a lot growing up, is more optimistic about the results (article). Two blogs are thrilled with the result…the Torontoist is obsessed with the building (proof) and Architechnophilia gives it a big thumbs up. Here are some images from the opening weekend. And my favorite image from a great Toronto photo blog, Daily Dose of Imagery. Here is a post about the opening ceremony. 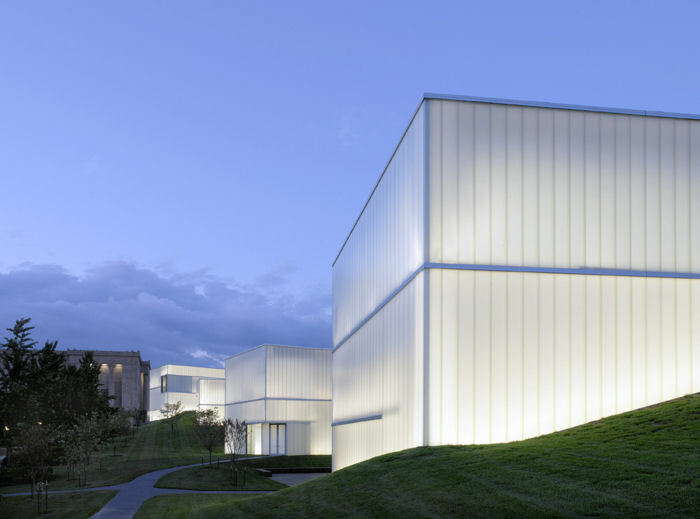 In Kansas City, the Nelson-Atkins Museum of Art added an addition of their own to their classical building and chose the brilliant and lesser known architect, Steven Holl, to do the honors. Known for its high-quality and finely selected collection, the Nelson-Atkins demonstrates that it continues to be a bastion of refined taste. The new addition will house the museum’s collections of contemporary and African art and feature new galleries for rotating exhibitions of photography. Here are some great images at Designboom that show some interior shots, which aren’t as awe-inspiring as the exterior (link). Time Magazine also talks about it here. It’s reassuring that museums are continuing to commission buildings that thrill.